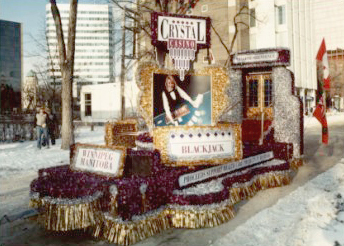 For over forty years, Astro Parade Float Materials Ltd. has been serving Canadians by designing and constructing award-winning parade floats as well as providing consultation, plans and materials for the do-it-yourselfer. We supply all of the decorating materials required including floral sheeting, vinyl twist, fringe, signs and cut-out letters in a wide array of colors. Everybody loves a parade and everybody benefits! A parade attracts people like bees to honey. Small town or large city, a parade is a spectacle... colorful and exciting. It generally kicks off a celebration, festival, or fair. It generates the excitement necessary to make the public receptive to subsequent festive activities. A parade livens up the community, entertains tourists, and generates goodwill - which translates into business. The participants in a parade have the opportunity to showcase their name and presence in the community. Whether you are a business, community or service club, trade union, charity, or fraternal organization, this is your chance to get out and express your gratitude and appreciation to the general public. As an added benefit, parades receive local and national press as well as radio and television coverage. There are also many citizens with cameras and camcorders. SO... LET'S GET BUSY AND BUILD A PARADE FLOAT! Click here to find out how easy it is to build a basic parade float. Float Design will give you some great ideas and, when you're ready to decorate, see Float Decorations. For a FREE catalogue, click here.